Jordan Green Clean is designed with both you and the environment in mind, enabling you to take care of your teeth with extra good conscience. ”Scandinavian design is as much about aesthetics as it is about functionality. 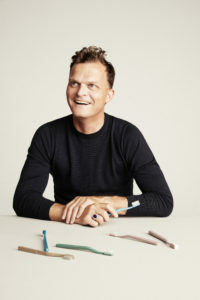 To me sustainability is also a big part of it”, says Norwegian designer Andreas Engesvik, the designer behind Jordan’s new toothbrush. Andreas Engesvik is highly regarded internationally for his work. He also has a strong interest in and focus on materials. 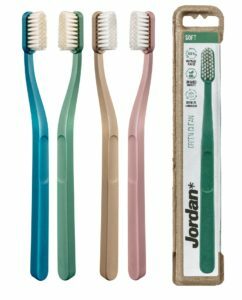 With its modern design, ergonomic handle and quality bristles, Jordan Green Clean combines great functionality and sustainable materials. In the design process, nothing is left to chance, and all materials are carefully selected with the environment in mind. In fact, 90 % of the total product (including packaging) is made of recycled materials, minimizing resource use and giving materials a new life. For instance, the toothbrush handle is made of recycled plastic originating from food containers, and the packaging is made of recycled paper fibres from paper-based products. The remaining 10 % mainly consists of the bristles, which are 100 % bio-based, and the packaging label, which is made of FSC-certified paper from responsible managed forests. True to Scandinavian design principles, Jordan Green Clean has a modern and minimalistic appearance, using only the materials necessary to ensure a comfortable brushing experience. As such, you don’t have to compromise on neither sustainability, functionality nor aesthetics – Jordan Green Clean is made with both you and the environment in mind. The toothbrush is available in soft and medium bristles, and in four different colors – making it a nice detail in your bathroom. What material is bristles made of? The nylon in the filaments are made from castor-oil and are 100% bio-based. The castor oil is extracted from the castor oil plant, which is a natural and renewable resource. It can grow well on marginal lands and under a wide range of hostile ecological conditions and will not compete with the agricultural sector that produces food and fibres. The bristles does not contain colorants. What material is the paper container made of? The paper container material is made from scrap papers from paper industries and unwanted commercial boxes collected by the waste handling industries. By using this paper scrap creatively, it is recycled into something protective and useful. What material is the label made of? The label is made of FSC and PEFC certified paper. FSC (Forest Stewardship Council) and PEFC (Program for the Endorsement of Forest Certification) are internationally third-party, non-governmental organizations serve to promote and uphold best practices for sustainable forest management. These certifications ensure that the wood raw material used in products is legally sourced and originates from sustainably managed forests. What type of glue has been used for the label? The adhesive is rubber based and have been engineered and produced as environmentally friendly as possible, without compromising performance. The adhesive conform to FDA regulations for indirect food contact, and is today used in many food-related packaging. Why recycled material? By using recycled material, we maintain the value of materials for as long as possible, and is part of a circular economy. As such, we minimize waste and resource use, giving products and materials new lives. Does the plastic contain any harfull Chemicals? The recycled plastic we use in Green Clean is FDA-approved, meaning that it is foodsafe and completely free from chemicals that can be harmful to put in your mouth. The source is yogurt containers, margarine tubs and other food containers from the refrigerated section of food markets. As such, the recycled plastic in Green Clean is completely safe, conforming to strict regulations!